Rogues Like Us 'Coming Soon' Store Page and Release Date! Our Coming Soon store page is now live! If you are interested in the game, I highly recommend you head on over and follow the game or add it to your wishlist to stay as up-to-date as possible! Rogues Like Us will be releasing on Early Access February 10th! Until then, you can prepare for the upcoming fight by following us on Twitter, Facebook, or by joining our Mailing List. Learn about the game, catch development streams, and become part of the community and make your voice heard! Rogues Like Us is Coming to Early Access Next Month! Hello everybody! oddByte is very excited to announce that Rogues Like Us will be coming to Early Access on Steam next month! For more information check out our most recent Kickstarter update where we go into our decision in more detail. We're going to be updating both our Facebook page and our Twitter more often going forward, so give them a like and follow if you want to stay up to date! We've also updated oddByte's site with some new screenshots, here's a preview below. Finally, thank you all for your support so far, we're looking forward to getting the game into your hands! You are an exile… a rogue cast out by your clan. No longer accepted by the society you used to know, you have been sent to rot on an island far out in the ancient lands. There is a rumor that these lands gave birth to the power the clan wields today. As you leave, you are told you have one last chance at redemption: find the source of this power, wield it, and fight your way through these lands to bring it home. Rogues Like Us is a 3D hack n’ slash rogue-like that combines the gameplay of The Binding of Isaac with the combat of Bastion, and brings it all together with a story and progression system that are based on the weapons you find and use. In most rogue-like games, the focus is on the character, unlocking new items through gameplay to help them progress, and achieving a goal that the character has. The core of Rogues Like Us revolves around the weapons you find, rather than the people. These aren’t normal weapons, but Soul Conduits that feed off of your life force, giving you immense power in return. Each rogue you play as will die, and with each death the weapons you use will feed and become stronger, imbuing even more power into the next rogue that comes along. These weapons are important to your clan, they protect the people you love. So what if you die? Maybe your efforts will provide enough power for the next rogue to achieve what you failed to do. Procedurally Generated Dungeons: fight your way through an endless number of unique dungeons! Dungeons are created through a combination of hand-crafted design and randomization, so each play-through is guaranteed to provide a different but balanced experience. Feed Your Weapons: Weapons progress and grow in power by feeding off the enemies you slay in combat. Awaken: Find dormant weapons and armor blueprints within the dungeons to increase your arsenal. Discover: Explore to find secrets hidden within the dungeon and learn about the ancient lands and their connection to your clan. Primary Weapon - This is your primary means of hacking and slashing your way through the dungeon. It will never dull, and it will never break. Feed it the souls of your enemies to increase its power, providing you with stat boosts and ability modifiers that change the way the you approach combat. Soul Blast - Channel the power of your weapon to unleash a devastating attack to all enemies around you. 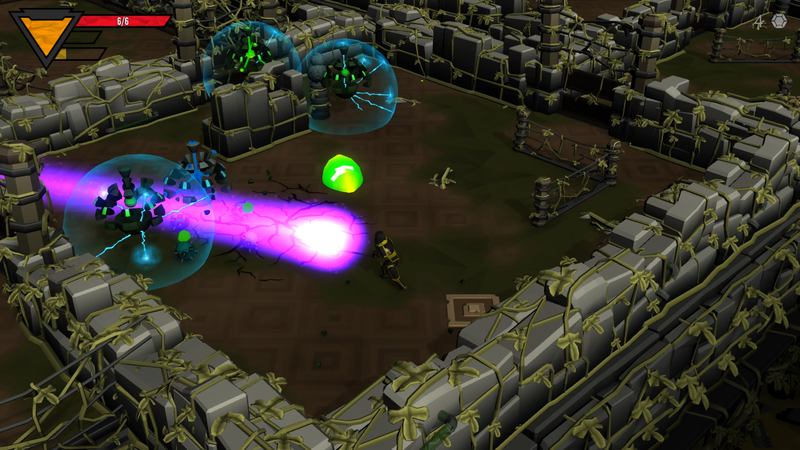 Soul Shot - Consume some of your weapon’s power to release a ranged blast that vaporizes all enemies caught within it. Phase - Empower yourself to move quickly and evade enemy attacks. Mastering this skill will allow you to survive the toughest of challenges. Weapons - These Soul Conduits come in many shapes and forms, with each modifying your stats and abilities. Find these dormant weapons hidden within the dungeons and feed them to unlock their special powers. Each weapon has five passives that modify and empower your stats and abilities, changing the way you approach combat. Armor - Discover blueprints in the dungeon to create armor that can protect you. Each armor set has a unique stat boost that will help you survive the dangers of the dungeons. Parts of armor sets can be mixed and matched, but equipping a full armor set will provide a bonus passive modifier. Shrines - Throughout the dungeon you will find ancient shrines whose power can be unlocked with your weapon. Harnessing this power will empower your stats and abilities during gameplay, helping you face the greater challenges of the dungeon. The game is currently in the alpha phase of development. We have spent 8 months on the game already, and have a very solid core gameplay and aesthetic in place. The main task ahead of us is bringing more depth and variety to the game, incorporating the weapon progression systems and story, as well as aesthetic polish. We are happy with the progress we have made on the game so far, and are excited for what we will be able to bring to the game as we work towards a release in Fall 2016. We are oddByte, a new indie game company based in Lansing, Michigan. We are group of six passionate indie developers who have recently graduated from the Game Design & Development program at Michigan State University (MSU). Between us, we have multiple years of experience: working at a professional indie game studio, working at a contract game lab creating games for clients (including NASA, the National Superconducting Cyclotron Laboratory, the Frankel Jewish Academy, and Michigan State University), and releasing 12 titles across Windows, Mac, iOS, and Android. this game look's like AWESOME!!!!!!!!!!!!!!!!!!!!!!!!!!!!!!!!!!!! The space bar is how you choose your weapon at the beginning. I saw this game at an expo and I love slash and bash games. I can see the potential in this game! Great work guys. Looking forward to having this on steam! Thanks so much for your support so far! A lot of you have asked about co-op, and it is defintiely something we want to look into if our Kickstarter gets funded. We have also just released a demo version of the game, so head on over to our site and get hands on with it! Rogues Like Us has been Greenlit and is now listed in the Steam store. For the latest information, purchase options, and discussions for Rogues Like Us, please see it on the Steam Store or in the Steam Community.